While America had been continuously growing more and more diverse, it was in the 1990s that the nation saw another large wave of immigrants come into the country. Whereas previously America’s immigrants had primarily from Europe, half of the immigrants coming into the country during this time came from Latin America and the Caribbean. The other half consisted of immigrants from Asia, the Middle East and Africa. Only 10% of the immigrants of this time came from Europe. Also, for the first time in history, women made up the majority of the immigrants coming into the country. This reflected the decline of factory jobs that previously attracted so many male immigrant workers to the country as well as the spread of employment opportunities in openings typically filled by females. Immigration not only changed regarding the countries that immigrants came from, but also regarding the behavior once they moved to the United States. Previously, most immigrants became inhabitants of the more urban areas and cities. However around this time, immigrants rather moved into outer neighborhoods and suburbs. The Kitchen Debate by Nixon and Khrushchev in 1959 has embraced many American ideologies at that time, and the role of women in the kitchen is one of them. In the 1950s, it was widely conceived that women ought to spend most of her time in the kitchen and doing various house works. Although Vice President Nixon did not explicit stated it, he has implied that the electronic appliances were so great that they are the equivalent of a woman. The Kitchen Debate further emphasized the fact that most American men at that time regarded their spouses as mere appliances in the kitchen instead of human beings. I believe that the underlying theme in the Kitchen Debate has a certain degree of influence on Betty Friedan’s The Feminine Mystique, a publication that has awakened the public feminist consciousness. With the influence from The Feminine Mystique, American women have realized that, by tradition, they have been enslaved in the kitchen. 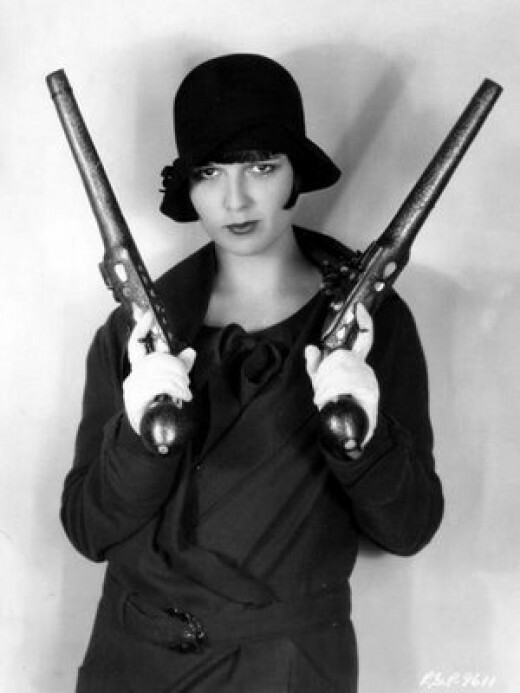 In addition, they were more conscious of the unequal treatments they faced in work forces. With this new consciousness in their minds, they have pushed for more reforms in civil rights movements. 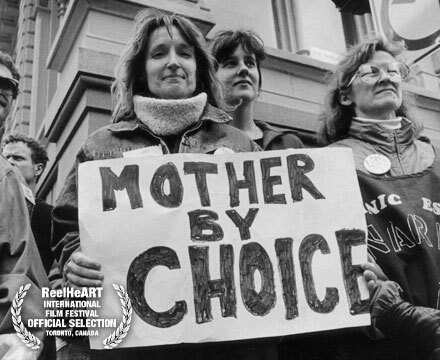 In response to the changes in public opinions, the government has passed various gender equality laws, such as the Equal Pay Act in 1963, which prohibited different wage standards base on genders, and The Civil Rights Act of 1964, which eliminated discrimination by both gender and race. Although during the 1950s, women began working more outside of the home and began to expand their horizons regarding the roles of modern-day women, the suburban lifestyle movement dominated. In the ideal suburban family’s household, the male still held the most authority and was considered to be the representative of the household because he still made the most money. A suburban female was supposed to be a stay-at-home wife. Various media pushed and glorified the married life for females. Marriage was portrayed to be the top priority for women. Advertisements portrayed wives working at home and doing household chores as extremely happy in the stay-at-home role. The number of women working outside the home increased significantly in the ’50s. By 1960, nearly 40 percent of American women had joined the workforce, and married women with school-age children represented a significant proportion of that number. Women continued to earn considerably less than men for doing the same job, regardless of whether they worked in a factory or office, or in a profession such as teaching or nursing. The fact that so many women worked outside the home ran counter to the myth in popular culture that emphasized the importance of traditional gender roles. During World War II most of the men in America went to fight for their country leaving the women behind at home. Women didn’t just stay at home tending to their children they went out working industrial jobs. Women started to work in factories or taking over work on the farm. 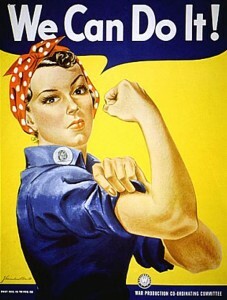 Since women started to work the famous “Rosie the Riveter” was the symbol for the most common job for women at the time. After World War II things changed again for women. Most women had lost their jobs in the factories but they still continued to work. The level of employment for women had increased since World War II, working part-time to help support their family. Eric Foner book says “Despite the increasing number of wage earning women, the suburban family’s breadwinner was assumed to be male, while the wife remained at home.” Even though women try hard to work films, Tv shows, and advertisement portrayed that marriage life is the dream for every women. An English and Yiddish sign asking for people to support the strike, by saying, “Help the garment workers in their fight for bread and freedom,” The Uprising of the 20,000, New York, New York: ca. 1910. From the Kheel Center at Cornell University. Strikes on the picket line, The Uprising of the 20,000, New York, New York: February 2010. From the Library of Congress. In the two photographs, it illustrates the dynamics of the Uprising of the 20,000 strike against the New York’s garment factories. 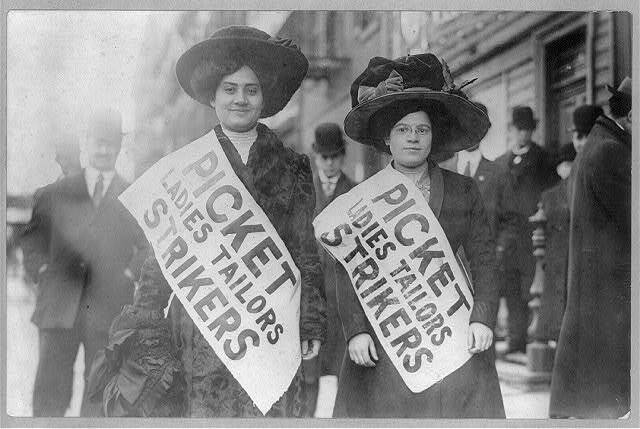 The strike, which began in November 1909, was the result of the incident at the Triangle Shirtwaist Company, where workers died because of the failure to monitor the working environment. 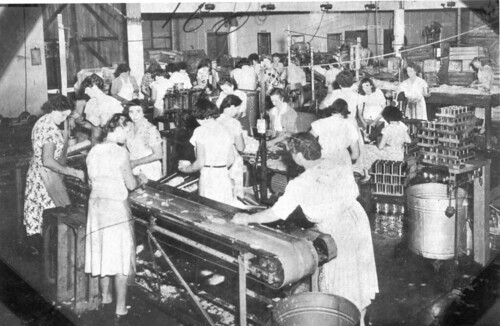 Immigrant workers, mostly Jewish women, were employed in the garment factories. In the first photograph from the Kheel Center at Cornell University, a sign in both English and Yiddish asked for people to support the garment workers win the battle in order to have “bread and freedom.” One of the primary concerns that the workers protested against their employers was safer working conditions. This photograph shows that the garment workers needed all the help and support they can get. The fact that the sign is in Yiddish shows how Jewish immigrants are deeply affected by the garment industry. In the second photograph from the Library of Congress, it shows two women on the picket line during the Uprising of the 20,000. These women look proud to be on the picket line as they are seen smiling at the camera. The women are portrayed to be bravely supporting their cause as they wear the signs with pride. There are several differences in the two photographs. The first photograph was taken in Decemeber 1909, when the strike just begun. It may be an indication that the strike was not generating enough support yet, hence the sign on the shop. However, the second photograph was taken in February 1910, a few months into the strike. By this time, the strike was gaining recognition and respect for their cause. This is the reason for the gloomy mood in the first photograph. In the second photograph, it shows that people were not afraid to stand up for what they believe in as they march and protest for their rights. In addition, the first photograph focuses more of the impact the strike has on immigrants when compared to the second photograph. During the Reconstruction, the primary focus was on the rights of former slaves. Women felt neglected because they believed they deserved attention as well. Women protested for reforming labor and divorce laws. However, women received little or no support for their cause. In addition, they found faults in the 15th Amendment because it only protected African Americans from discrimination but not women. As a result, a group of feminists led a movement to raise awareness for women’s rights. In 1869, the National Woman Suffrage Association, founded by Susan B. Anthony and Elizabeth Cady Stanton, was one of the women’s rights organizaton that was established. 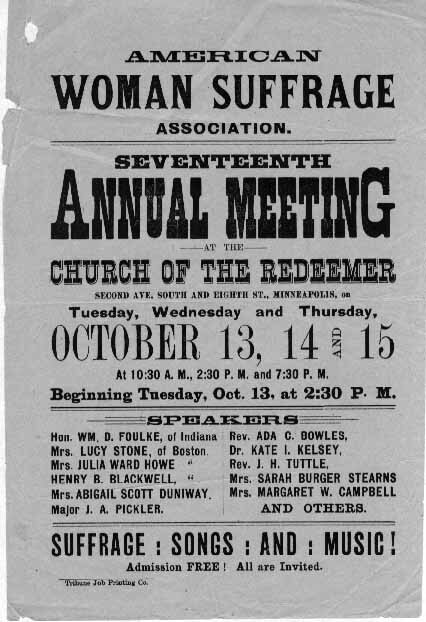 Their chief concern was advocating voting rights for women through a new amendment to the Constitution. In addition, they supported simpler divorce laws and equal pay for women. However, a year later, the organization joined American Woman Suffrage Association to become the National American Woman Suffrage Association. This collaboration would further assist them in promoting for women’s rights.